We have another busy weekend planned and we will be open on Saturday from 08.00am onwards, Sunday we will be open from 08.30am. We would like to welcome all of our student jumpers for hopefully another thrilling weekend. 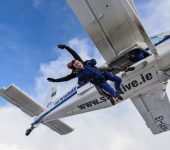 If you don’t get to do your jump this weekend because of weather we are going to be open for a full 11 days from 1.00pm Friday the 22nd of July to Monday the 1st of August. It is a great week to for all students to get their jumps. We will have instructors available from early on both days and for the week that we are open.